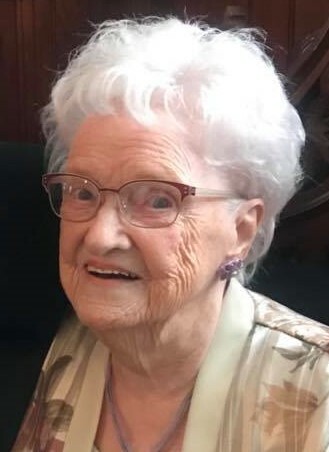 Obituary for Marjorie C. (King) Schrom | DeMarco-Stone Funeral Home Inc.
Rotterdam – Marjorie C. Schrom, age 94, passed away at St. Peter’s Hospital with her loving family at her side on Thursday, October 18th, 2018. Born in Cobleskill on November 27th, 1923, Marjorie was the daughter of the late Murphy and Edna Tripp King. Marjorie spent her spare time enjoying winters in Florida with her husband William and volunteering at the Teresian House in Albany. She was a member of the Bethany Evangelical Lutheran Church in Central Bridge, NY. Marjorie was predeceased by her husband of 61 years, William H. Schrom, three sons, William H. Schrom Jr., Douglas W. Schrom and Kenneth C. Keller as well as two brothers, Harvey King and Howard King. She is survived by two children, Murphy C. Schrom and Diane (Russell) Pullen, two daughter-in-laws, Elizabeth Keller and Linda Schrom and one sister-in-law, Jane King. She also leaves behind many grandchildren, great grandchildren and great great grandchildren. At Marjorie’s request there will be no services. The family respectfully requests that donations be made to Bethany Lutheran Church, PO Box 273, Central Bridge, NY 12035 or to Rotterdam EMS, 2007 Cardiff Rd., Schenectady, NY 12303.